Olimp Labs Hepaplus is a dietary supplement that effectively promotes the liver health, its proper functioning as well as supporting the digestion of food and the excretion of unnecessary metabolic products. This supplement contains three groups of ingredients - artichoke extract, L-ornithine aspartate and B group vitamins. Hepatic protection and the comprehensive support of the liver are extremely important because the organ is exposed to many factors that interfere with its functioning. These include, among others, caffeine, drugs, alcohol or even fatty foods. We are not always able to avoid potentially harmful factors, but when providing liver with additional protection, we will be able to enjoy our health for longer. Artichoke extract (Cynara scolymus) is a natural extract from a plant originating from the Mediterranean. This extract is standardized for a content of 5% cynarin - the most valuable health-promoting substance contained in the artichoke. Cynarin is a compound that focuses on the functioning of the liver, but it can also positively affect some of the blood parameters. It has hepatoprotective effects and supports the regeneration of the liver cells, which is why it is often a component of medicines used in the cirrhosis of this organ. In addition, it also stimulates the production and secretion of bile, which is responsible for the emulsification of fats, what greatly facilitates and accelerates their digestion. Cynarin helps in the disposal of toxins that reach the liver and shows a mild diuretic effect, which speeds up the removal of harmful metabolites from the body. In addition, this compound causes a reduction in a total blood cholesterol. Another component present in this extract is inulin, which has a fiber-like effect - it causes a feeling of fullness, thus promoting slimming. It also regulates the level of glucose in the blood. L-ornithine aspartate is a combination of two amino acids - aspartic acid and ornithine. Ornithine accelerates the synthesis of harmful urea in the urea cycle that takes place in the liver. Thanks to this, it facilitates more efficient hepatocyte regeneration and has a beneficial effect on the metabolism of macronutrients supplied with food. In addition, L-ornithine aspartate also participates in the synthesis of glutamine, which is formed as a result of binding of urea by aspartate and in this way can be safely transported in the body without damaging the surrounding tissues. Complex of B vitamins, which are water-soluble vitamins: B1 (thiamine), B2 (riboflavin), B3 (niacin), B5 (pantothenic acid) and B6 (pyridoxine). Vitamin B1 (thiamine) in the cell participates in the transformation of keto acids as a coenzyme of thiamine pyrophosphate, which indirectly allows the metabolism of carbohydrates, which are the source of energy in the form of ATP. It also intensifies the action of the neurotransmitter acetylcholine and enhances the secretion of follicle-stimulating and luteinizing hormone, which enable normal function of testes and ovaries. Large deficiencies of this vitamin are the cause of disorders of the nervous, circulatory and digestive systems. Vitamin B2 (riboflavin) is an important compound that allows oxidation and reduction reactions and supports the proper functioning of the nervous system. Its presence also determines health of the organ of sight and the proper functioning of mucous membranes and skin. Vitamin B3 (niacin) present in this preparation as a nicotinamide plays a key role in the transformation of carbohydrates, amino acids and fatty acids. It stimulates the proliferation of red blood cells and inhibits the synthesis of bad cholesterol (VLDL) in the liver while contributing to an increase in its good variation (HDL). Vitamin B5 (pantothenic acid), or actually calcium D-pantothenate is another vitamin involved in the transformation of proteins, fats and carbohydrates, as well as the synthesis of hormones. It supports the action of almost all systems in the body, and also allows the production of neurotransmitters and energy in cells. Its deficiency is may lead to the deterioration of cognitive functions - people with too low levels of this vitamin suffer from problems with learning, concentration and memory. Vitamin B6, in this case pyridoxine hydrochloride is a substance that improves the body's immune system and is often used to relieve the symptoms of premenstrual syndrome or carpal tunnel syndrome and to treat kidney diseases; it also prevents the formation of stones in the urinary tract. It is involved in the regulation of blood pressure and the production of biologically important compounds - enzymes, hormones and hemoglobin. 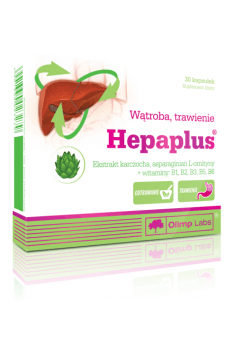 In summary, Olimp Labs Hepaplus is a dietary supplement aimed at supporting the functioning of the liver. It contains active ingredients with hepatoprotective and detoxifying properties. The product facilitates the removal of unnecessary metabolic products from the body. The substances contained in this preparation have a positive effect on the lipid profile, especially on the concentration of bad and good cholesterol. This product also contains a set of vitamins from group B, which positively affect the whole body, preventing frequent deficiencies and supporting its operation in a comprehensive way. Take 1 capsule 1-2 times a day during a meal, washed down with a lot of water. Do not exceed the recommended daily portion. Artichoke extract has cholagogic and cholepoietic effects. The preparation is recommended to people who are prone to the effects of harmful substances and among others in case of arteriosclerosis, fat metabolism disorders, inflammations of gallbladder and bile ducts. The preparation may be combined with the Silybum marianum extract to increase its effects. Microcrystalline cellulose - bulking agent, magnesium stearate - anti-caking agent, capsule (gelatin - capsule shell, color: E171).